Links The experience is one of the most important properties of a person. Together with the genetic heritage it characterizes the character and the relationship with the surrounding environment. The experience, together with education, is particularly important for the pursuit of professions. Currency trading is one of the fields where experience has a very significant role. Below is a text where a Forex enthusiast analyzes the mistakes he made. The purpose is to help the others avoiding making the same mistakes. It's true you learn better from your own mistakes but it is much more "convenient" to learn from those made by others. In order to exploit the experiences of others, it is necessary at least partially to know the person and his relationship with the theme of which we speak. I would call myself a prudent trader: for me it is more important to safeguard the capital I manage than that to get a high profit. At least in words, because as we will see below, I have been the victim of my greed, the desire to overthrow. I hope this analysis can help me too, to go back on the right track. I am a daily trader, that is, I tend to close the position on the same day with a gain of 3 to 10 percent. The experience has taught me that this way is often not practicable because it is difficult to guess the price trend. For this reason, I assure myself by setting the "stop loss" on 100% of the invested amount. The reason would be: even if I'm wrong, sooner or later the price will return to the favorable range. 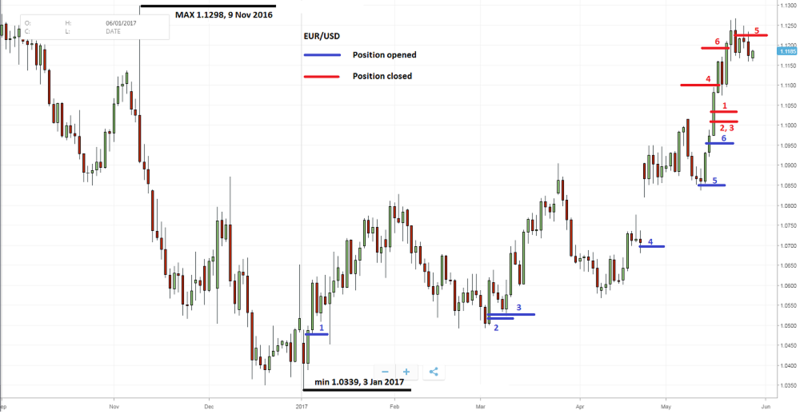 Considering that the position may remain open for a long time, I work almost exclusively by selling couples EURUSD and GBPAUD. On the platform I use, on these pairs on sale, they don't apply the fee for transferring the "overnight" position, or rather, from one day to the next one. Indeed, in these cases you even get a little interest. I've start trading with my money at the beginning of November 2016. I'm writing this text at the end of May 2017. So my experience is about 7 months. Until the middle of April everything was just fine. I've managed to double the initial capital. At that point things have changed. First I lost all my accumulated earnings and in May I lost 80% of the amount with wich I had started this adventure. As already mentioned, I only trade with two pairs. Here is a brief analysis of my losing operations for each pair. It's interesting that in both cases there are 6 mistakes. I immediately anticipated the main mistake I had committed: I had not harmonized the potential negative limit where the price could come (contrary to the desired trend) and the leverage applied. Below, I have prepared a summary of the operations that ended in the loss of the British pound - Australian dollar. All positions are short, or rather, sales. In the chart below, with blue color are shown the times and the prices of openings for each of the six positions. In red is the same data for the closures. At first glance you will notice that in the period shown the price rises as I continue to sell. I played against the global trend, hoping it will return in my favor. It's the number one mistake. The second was that the leverage I used did not consider the possible negative limit (loss side) that the price could reach. In the chart for the observed period (September 2016 - May 2017), the maximum price reached is 1.7800. This could be a point of reference for me. At the end of my negative period, the price came very close to 1.7650, without exceeding the historical maximum. Comparing the 1.7800 limit with my first operation (1.6180), there is a difference of approximately 10%. With the leverage 25 I've used, all the amount invested covers only 4%. Even a 10 times leverage is at the limit to cover the risk. In fact, the appropriate leverage would be for 5, to have a safe margin. Taking the same consideration for the penultimate operation, number 5 (1.6904), the margin is 5.3%, even this does not cover with leverage 25. From the table you see that I "defended" 3 positions on 6. I raised the "stop loss" by investing more money. For this reason, losses are higher than 100%. The sixth, last shown position was opened with a leverage 50, totally out of place. A clear sign of despair in an attempt to recover the money that had previously been lost, which only led to a further loss. At that time I was already aware that the Australian dollar was heavily dependent on the price of iron ore. Australia is the largest producer and exporter in the world of this mineral. The price variation greatly influences the state's accounts. I had the argument, but I never went to check the price of this raw material. Laziness can cost you. It took me a few seconds to find the charts with the price trend. Examining the grafic below, one sees clearly the tight bond of iron ore and the Australian dollar. 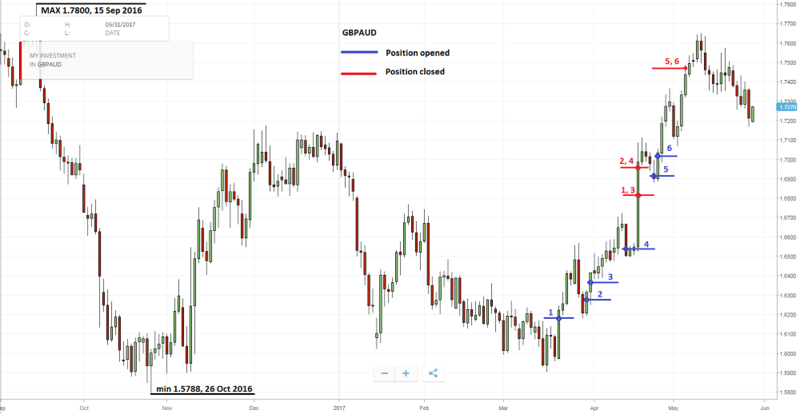 When the price of the first one started to fall, in mid-March, the Australian dollar was down, that is, the rise of the GBPAUD pair. If I had readily read the chart, I would have saved a lot of money. Another mistake. Do not forget: the right information is money in forex, directly or indirectly. The story of this couple is very similar to the one just described. The error number one is the same: the price went up and I insisted on sales. From the table you can notice that I "supported" 5 positions on 6, investing further to increase "stop loss". Once again in vain and this further increased my loss. Here is again the disagreement between the leverage and the negative limit, where the price could come to my disadvantage. The maximum value in 8 months, shown in the diagram below, is 1.1298; the day of the US President's election. It is also very obvious that operation number 1 was executed one day after the minimum of 1.0339 was reached; it was January 3rd. This date marks the point where the euphoria of financial markets, due to the election of the new US president, is over. The US dollar began its descent. The difference between the highest limit mentioned above and my first position is 8%, twice that of leverage 25. If I applied the multiplier 10, even today the position would be open as the "stop loss" would be set to 1.1470. By the middle of March the trend has changed and the price approached to 1.0500. I opened two new positions (number 2 and 3) to only 16 points difference between them and about 50 pips from the position opened in January. A new error, compared to the currency pair previously described. Opening very close positions of the same type does not make much sense. It would be correct to leave a gap of 100 or more points. The last operation opened with multiplier 50: another symptom of desperation. Do not take for certain subsequent conclusions. Think of it and see if they convince you because, I am still a beginner. I'm sure many good traders would argue over my arguments, supporting their observations with valid arguments. Do not go against the global trend, especially not for long periods. Based on historical data, determine the value of the maximum possible negative limit, the unfavorable one that the couple can reach. Adapt the leverage to that value. In this way, the "stop loss" of 100% of the invested capital guarantees that the position remains open even in the worst case scenario. For the determination of the negative limit, the trend diagram for a given interval is used. The longer the interval, the more we are covered. Do not open the positions of the same type too close to each other. Know the basic characteristics of both currencies you are using to trade, that is, which are their value depends primarily (an example is the close connection between the Australian dollar and the iron ore price). If you want to invest with Forex, you should use the low leverages. When using high multipliers you can no longer speak of an investment; you go into the gambling field.